The Gulf of Mexico oil slick is headed for your favorite seafood place at about the same pace as it is the Gulf coastline. Wholesalers and restaurateurs have already seen a jump in oyster prices and predict shrimp and certain Gulf-specific fish such as amberjack, Spanish mackerel and mullet could soon follow. The cost of shucked oyster meat jumped 10 percent on Friday, and half-shell oysters were up 9 percent on Tuesday from the week before. Federal authorities began closing oil-affected portions of the Gulf of Mexico to commercial fishing on Sunday. The closure area boundary reaches from the southeastern tip of Louisiana to the waters off Florida’s Pensacola Bay. Gulf waters produce 40 percent of the fish harvested in the continental United States, according to National Fisheries Institute statistics. Yet the abundance of imported seafood – which accounts for 80 percent of the seafood consumed in the U.S. – should prevent prices from soaring, said Ray Clark of Live Oak Restaurant Group, which includes local seafood haunts Tubby’s, Fiddlers and River House Seafood. Live Oak buys only domestic shrimp and purchases a year’s worth each winter during the season, Clark said. He won’t shop for shrimp again until late fall, by which time the Gulf will – presumably – be open again. Market price for shrimp rose approximately 10 cents Tuesday. The oil slick has prompted local shrimpers to be prepared for high demand this season, which opens in a few weeks. Oyster-lovers will be those most impacted by the closures in the Gulf, Ambos said. 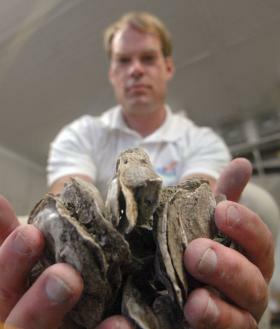 Savannah gets 75 percent of its oysters from the region, although demand is heaviest in the fall and winter and drops off significantly each June. “If this happened in September or November, it would be crazy,” Ambos said. Oyster producers from other areas, including the Chesapeake Bay, have inquired about providing oysters locally. Savannah wholesalers and restaurants also get oysters from local beds as well as those in Bluffton, S.C. and in North Carolina. Prices on other items in the seafood case could also creep up as consumers buy substitutes for products in short supply, Live Oak’s Clark said. Read the original article from Savannah Now here. © Ambos Seafoods, LLC 2019 All rights reserved. Site by Andrea Nordstrom.